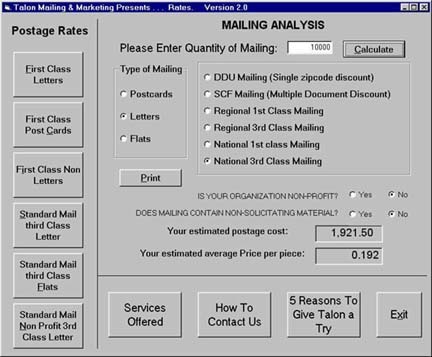 Talon Promotes One-On-One Marketing Programs. Communicating with your clients one-on-one is now easier than ever. Can full color digital printing and one-on-one marketing increase your sales? Above: Personalized Birthday Card - outside and inside view. Below: Invitation to an Islander Game, note the recipient's name on the scoreboard. It started with a simple email. Talon sent an email to our customers and prospects requesting they send us their birth date (we told them to omit their year of birth). The information obtained was put into our customer and prospect database. 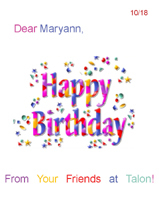 Now, once per week, Talon prints and mails personalized Birthday Cards to people in the database who will be celebrating a birthday. 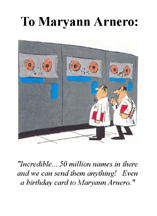 The Birthday Card promotion was the first of several marketing promotions designed to reach out to our clients. Since our database tracks an individual's favorite sports teams and recreational hobbies we will be producing upcoming promotions that include: A New York Islander card promotion with the recipient's name on the scoreboard and an invitation to an upcoming hockey game. Planned for next spring is a Golf Invitation that shows a gorgeous picture of the golf course and a golf ball with the recipient's name on the ball. Also slated for the Spring are Yankee and Mets invitations that will show the stadium scoreboard personalized with the recipient's name. It allows us to reach out and communicate one-on-one with clients and prospects. It provides the recipients with a sample of the quality and opportunities that are available with digital printing and personalization. One-on-one marketing is a powerful way to reach your clients and prospects. Show variable pictures how a donor's gift is being used. Recognition of special gifts and donations. Spice up invitations such as golf outings or special events to increase response and participation rates. Recognition of birth dates or other special dates. Create offers and images that truly target your customers interests. Cut through marketing clutter and let your promotions stand out. Quick turnaround - Now your full color work can be run in under 24 hours. 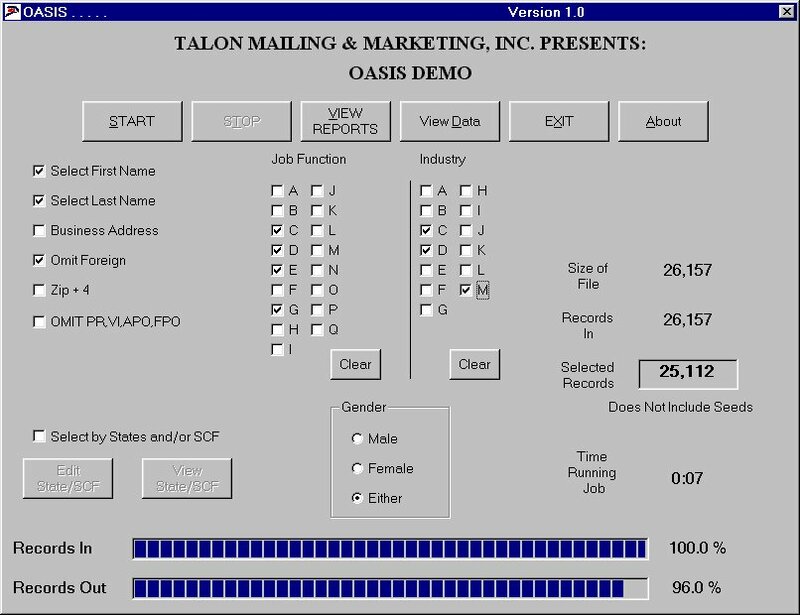 To discuss how Talon's new technology can help your business grow contact Michael Borkan at 631-667-5500. Direct Mail Advertising - 3 Essential Ingredients. Direct mail advertising has three critical components. This type of marketing can be hit and miss so knowing the essentials is very useful. If you use these direct mail advertising components when marketing your business or products you will achieve great results. 1) Your headline is the absolute most important factor in direct mail advertising. Make sure your advertising appeals to the needs and the hot buttons of your intended audience. When you are using direct mail advertising you need to put yourself in the consumers' shoes. That’s why targeting is so important. Find out what appeals most to your target and what they need. Then appeal to those needs and interests in the headline of your direct mail advertising. 2) For your direct mail advertising to be successful you need the right lists. You're spending money sending out your mail. Make sure the people who get your direct mail advertising are the right people. 3) Your direct mail advertising must outline a two-step sales process. This type of process motivates your target to take immediate action. They must reserve a seat, request a report, set up a free no obligation mini needs analysis, etc.... Direct mail advertising does not actually sell your company or the services or products that you offer. Its purpose is to convince the target to take action or to raise their hand to show they are interested. Good direct mail advertising gets them interested enough to make an inquiry or other type of response. Once they do that then you sell them on what your company offers. Direct mail advertising can be tricky. The essential components of a direct mail advertising campaign are a standout headline, acquiring the right list, and instigating a two-step sales process. If your direct mail advertising accomplishes these three things then your chances of success with this type are marketing are significantly increased. Joshua Feinberg helps computer consultant business owners get steady, high-paying clients. Sign-up now for Joshua's free audio training that shows you how to use field-tested, proven Small Biz Tech Talk tools at www.SmallBizTechTalk.com/blog. We are giving away two tickets to see the New York Islanders. These seats are center ice, four rows from the action! To win, be the first telephone caller (please don't hit reply or email). Call Michael Borkan at 631-667-5500 x 303. Monday Afternoon (Columbus Day), October 8th, 2007, 2PM. Islanders vs. The Washington Capitals. Findaid.org - A Guide to Financial Aid, this site is a comprehensive free resource for objective and unbiased information, advice and tools on student loans. savingforcollege.com - Objective information about college savings plans and other ways to save and pay for college. Flyertalk.com - A community where frequent travelers exchange knowledge and experiences about everything having to do with travel. Gocougar.com - Online dating for older women looking for younger men.